Sri Nisargadatta Maharaj (17 April 1897 – 8 September 1981) was an Avaduta who imparted lessons on the Self to those who desired to know That. Nisargadatta Maharaj quotes are from various sources. They have been collected over a period of more than 10 years. Those who know only scriptures know nothing. Love says: “I am everything.” Wisdom says “I am nothing.” Between the two my life flows. What you are now is the result of inattention, and what you become will be the fruit of attention. To be always on the move, learning, discovering, unfolding, is your eternal destiny. Living is life’s only purpose. To live without self-concern. You are quite satisfied with pleasures (external). There is no place for happiness (internal). Empty your cup and clean it. It cannot be filled otherwise. Others can give you pleasure, but never happiness. There is no east or west in sorrow and fear. The problem is universal – suffering and the ending of suffering. The cause of suffering is dependence and independence is the remedy. Awakening, or enlightenment, or liberation is nothing, absolutely nothing other than perceiving profoundly, deeply, intuitively that what we are – that which is here now – is the absolute absence of whatever is imaginable or recognizable. As long as you take yourself to be a person, a body and a mind, separate from the stream of life, having a will of its own, pursuing its own aims, you are living merely on the surface and whatever you do will be short-lived and of little value, mere straw to feed the flames of vanity. Nor the source nor the universe have come to tell you that they have created you. The mind, obsessed by the idea of causality, invents creation and then wonders, “Who is the creator?” The mind itself is the Creator. Even this is not true, for the created and its creator are one. The mind and the world are not separate. Understand that what you think to be the world is your own mind. All space and time are in the mind. There is only imagination. It has absorbed you so much that you just cannot grasp how far from reality you have wandered. No doubt imagination is vastly creative. Universe upon universe are built on it. Yet they are all in space and time, past and future that do not exist. It is you who are in movement and not time. Stop moving and time will cease. Past and future will merge in the eternal now. In Nature, everything is time-bound (seasons, sowing, reaping etc) but nature itself is not time bound. Nature is neither male nor female. Many Avatars come and go, but nature is not affected. The story of nature is emanating from all the impressions taken in your mind since birth. So long as you are holding on to these memories there will be no knowledge of Self. If you just study whatever has happened in nature, like history, great lives etc., you cannot realize your Self. You have to go within. Once you know that death happens to the body not to you, you just watch your body falling off like a discarded Garment. The fear of death is fine for accepting the identity of the body as a separate entity in the total functioning. People are afraid to die, because they do not know what is death...the moment you know your real being, you are afraid of nothing. Death gives your freedom and power. Question - If I desire nothing, not even the Supreme? 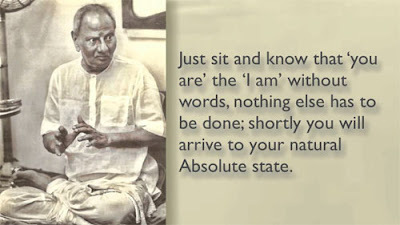 Nisargadatta Maharaj answers – Then you are as good as dead, or you are the Supreme. When a jnani dies, he is no more, in the same sense in which a river is no more when it merges in the sea, the name, the shape, are no more, but the water remains and becomes one with the ocean. When a jnani joins the universal mind, all his goodness and wisdom become the heritage of humanity and uplift every human being. …there are all kinds of methods and systems which come with promise of liberation in ten or twelve days. As for myself, I no longer care about all this. I have come to this nothingness in which the search has ended because the seeker has also disappeared into that nothingness of which we are talking. I no longer take any interest in that research. First I have seduced Maya (illusion) and once the Maya surrendered to me, I had no other use of Maya so I threw her out. Thousands of organizations have come and gone, thousands are yet to come. All of them are based on a certain concept. But have the people because of that concept been able to realize their true nature? Therefore, none of these organizations have any use; the ultimate thing is to find out about one’s true nature. In this organizations can do nothing, because they are all based on a certain concept. All desires are bad, but some are worse than others. Pursue any desire, it will always give you trouble. Why desire at all? Desiring a state of freedom from desire will not set you free. Nothing can set you free, because you are free. See yourself with desireless clarity that is all. In the light of calm and steady self-awareness, inner energies wake up and work miracles without any effort on your part. The seeker is he who is in search of himself... To know what you are, you must first investigate and know what you are not. Discover all that you are not – body, feelings thoughts, time, space, this or that – nothing, concrete or abstract, which you perceive can be you. The very act of perceiving shows that you are not what you perceive. Sometimes I feel I am everything, I call that Love. Sometimes I feel I am nothing, I call that Wisdom. Between Love and Wisdom my life continuously flows. What is beautiful? Whatever is perceived blissfully is beautiful. Bliss is the essence of beauty.